10 January 2018, at 12:00a.m. Recent research at the Agri-Food and Bioscience Institute (AFBI) has shown that sows can wean litter weights of over 115kg at 28 days of age and that pigs with low birth weights can have feed efficiency ratios under 2.4 during the finishing period. Commercial litter outputs rarely exceed 105kg and the average feed efficiency of finishing pigs in Northern Ireland is approximately 2.7, however, the superior performance outputs achieved at AFBI in the current research indicate that improving upon on this is certainly achievable. The AFBI outputs are driven by a combination of nutrition and management, and demonstrate the high potential that both sows and low birth weight pigs can achieve. Due to significant increases in litter sizes over recent years, piglet birth and wean weights have reduced, impacting lifetime performance, and therefore a conflict in terms of productivity has arisen. 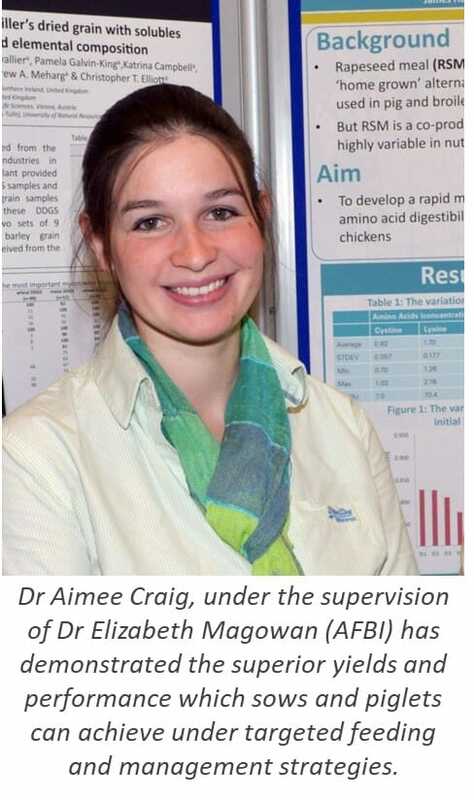 This issue is being addressed by Dr Aimee Louise Craig as part of her postgraduate work at Hillsborough, which aimed to develop nutritional and managerial strategies to increase piglet and litter wean weights, and optimise the lifetime performance of low wean weight piglets. The studies were funded by the Department of Agriculture, Environment and Rural Affairs and the work was completed at AFBI, Hillsborough in conjunction with Queens University Belfast. Offering lactating sows a high energy and lysine diet at an intake of 7.5 kg per day will drive superior litter performance. The estimated value of this extra performance is at least £1m for the Northern Ireland pig industry. Improving the environment of the farrowing house to encourage high feed intakes will also improve piglet weaning weight. Furthermore, there could be economic advantages associated with offering small pigs at weaning (< 6kg) extended suckling coupled with lifetime dietary changes which match weight development. The research provides a strong basis for adjusting current on-farm practices that support both welfare and growth in sows and weaning piglets.